Interesting...perhaps it's time to rethink my strategy. Thanks! The notion that $1.99 is a black hole is very valuable. Thanks! 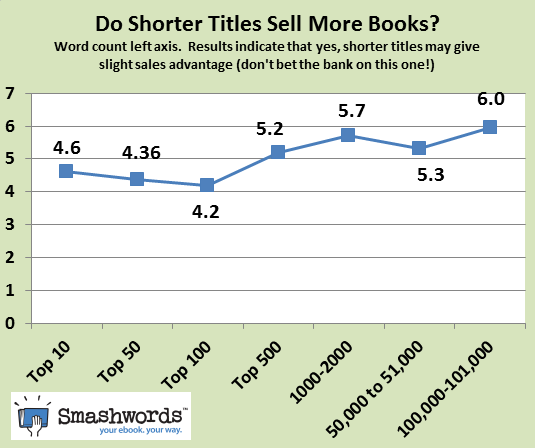 Might this number of books sold also include the number of titles sold as a % of total inventory? With metrics as stated, seems that the top 5% of the ebooks sold account for more than 80% of sales volume. That number must be in there somewhere Mark. Perhaps all will be reduced to one or two popular genres. The short story format will die because retailers called everything a "book" and didn't offer ways to market short fiction. Rarely in the cause of Indie writers has one man done so much for so many. It'd be interesting to see a graph of profit-per-word. That is, short fiction might sell less, but it's also less work. Is a novella a better time investment by an author than a novel or a big honking novel? Than a short story? Hi Mark. My gut feeling is that a lower price (eg $2.99) is best for a short book or novella, and a higher price (like $3.99) better suits a full length book. Is there a way you can analyse the figures to prove or disprove this theory? Thank YOU Mark! That is great news! For some reason I decided to price my novel at $3.99 when I relaunched and actually lengthened my novel to make it more of a "novel" than a "novella", and so far I am very happy with the results. THANK YOU for doing so much for so many of us! I don't know...lengthening a book just soit will fit into a category? Sometimes they are, but a lot of times short stories aren't dashed off and ready to be published in one evening. But I also want to thank Mark and Smashwords for the work they do. If only other retailers provided the tools Smashwords provides. It's comforting to see how my novel is on the right track - $3.99 and 114,500 words - and you're so right about not forcing that word count. I was actually hoping for 70,000 and when it was done, well, now I'm glad I didn't split it up. I got lured by the Amazon Prime promo, so I'm only on there for another 6 weeks...can hardly wait to try Smashwords. Finally, thanks so much for putting together your guidelines for formatting. I spent a few hours going through it, and it helped tremendously - uploading was incredibly smooth - I see your guide being mentioned all over the web, so it seems to be becoming a standard of sorts. I get plenty of page views, a few sample downloads and very few smashwords sales. I know I have slacked off self-promo (it is so tedious) but can you suggest some optimal forms of self-promo? I mostly rely on twitter and my web site. I have received no negative feed back re formatting or typos, and few negative reviews. Most say, "interesting" "fast paced" etc. I have recently published my first children's ebook. In reading this article, I now have a better understanding of why I have not sold as well as I had hoped. Though much of your advice is for the novelist, and mine is a simple picture book for toddlers, I see how the same concdpts translate. Thank you. I'm considering revamping or completely rewriting my book. Thanks Mark for the data. I've seen you speak about the beginnings of Smashwords and am glad that you're sharing the data with everyone rather than keeping it to yourself. I've seen a backlash to authors serializing their works and putting a major cliffhanger at the end of each book. If you don't complete the story, you frustrate the reader and show yourself to be driven by monetary gain rather than reader satisfaction. In my opinion, a series book needs to have a resolution. It is fine if the new book starts another adventure, but to leave a big honking cliffhanger with the main characters is reading interruptus. Your data seems to bear this out in terms of word of mouth and long term sales. Thanks for being so sharing! Thank you, Mark! This post comes at the perfect time for me, as I am teetering on the verge of my first publishing endeavor. I will keep your findings in mind. You said "I think the percentage who go indie will continue to increase. What do you think?" I think you are absolutely right Mark. Thank you for the valuable and useful information. Thanks for crunching those numbers, I'm going to make some adjustments accordingly! Thanks for the insight, Mark, and for the great opportunities Smashwords affords. A friend referred me to Smashwords over a year ago and, fortunately, it was my first self-publishing ebook site I ever worked on. I won't be switching any time soon. Thank you. If you have data on the downloads of FREE titles in the Apple iBookstore, why do you not report it to each author in their sales reports? I submitted an inquiry on this and was told by Smashwords support that Apple does not report free download data to Smashwords. Please clarify. Thanks for a great report. Graphically, you'd need to plot the data out in three dimensions, with word count along the x, price point along the y, and sales up the z. And I agree, that would be a very useful next step. Great post full of interesting data. 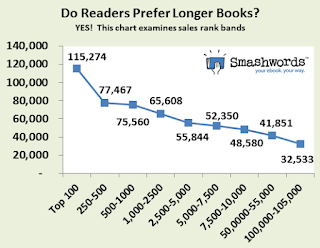 Before you can say that readers prefer longer books, you need to analyze where a given author is in terms of releases. Best sellers are usually from more established authors. The first Harry Potter was 65,000 words. the last was 280,000. If she'd started with a larger book, she never would have been discovered. People don't invest that much time in an unknown. As someone who publishes directly on iTunes, I can tell you that Apple does indeed provide download data for free titles the same way as it does for paid sales. I can't speak for whether they've always done this, but they certainly do now. Thanks for the comments, everyone. You've given me some ideas for next year's survey. @JJ, I think the data pretty conclusively shows that $.99, $2.99 and $3.99 are the price points that get the most unit sales, and that higher word count (regardless of price) is prefered by readers, judging by their votes with their dollars. As you can see in the presentations chart that looks how many words you can buy for penny, you get a good sense of the wide variation. So to your question, $2.99 for novel and $3.99 for full lenght, the answer is, "it depends on multiple factors." 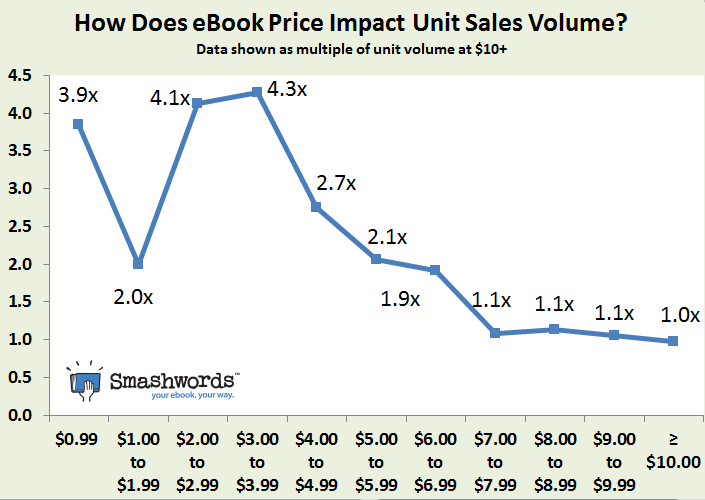 The pennies chart does seem to indicate, though, that higher priced novellas are rare in the $2.99 price point. @Virginia Keep in mind that the Smashwords store represents less than 10% of the sales we're getting our authors. Over 90% of the sales are coming from our retailers. I'm not a huge believer in marketing when compared to other priorities. The best marketing is a book that markets itself on word of mouth. Take a look at my recent blog post, Six Tips to Bring Your Book Back from the Doldrums. I think you'll find that helpful. It's all about eliminating the friction that's preventing readers from discovering or enjoying your book. Also take a look at my Secrets book (link is on the right margin here). @Miss Crystal, most of this data here won't be terribly relevant to children's picture books, sorry. @Rachalle, I'm not a big fan of serialization either. Our data shows so conclusively that longer works please readers more. I think serialization can work great for a work in progress (and great if done with our friends at WattPad), but the feedback I receive from readers is that they'd prefer to read a good book all at once. Each time you make it so the reader has to search for the next book in a serial, and find it, and purchase it, and then download it (all the steps to load an ebook), these steps create friction that can interrupt what would otherwise be a compete reading experience. I know there are examples of authors who've had great results with short serials (as opposed to full length series as you mention), but I wonder if that success was primarily due to them writing an irresistibly awesome story, and not because it was a serial. Very important to separate cause and effect. I would also guess that once combined into a single full-length book, the once-serialized book would be more popular. Who today would prefer to start reading Oliver Twist as a serialized ebook across 24 monthly installments(as it was originally published), as opposed to a single book now? I imagine there are a few people who'd prefer to read one installment per month for next 24 months, but it'll be a minority. @Larry The monthly audited sales reports we ingest from Apple don't include free downloads. Our daily and weekly reports from Apple do, but we're not yet ingesting those. Once we do start ingesting them, we will report free downloads back to authors, just as we do for B&N and Sony. Sorry if our staffer didn't properly clarify that. @Seeley, I doubt that's the case, but there are always exceptions to any rule. I'll bet JKR would have held the reader's attention at any length. Many of the bestsellers on this list are from indie authors who were unknown just a year or two ago. I think the argument can be made that great stories that are longer satisfy readers more than great stories that are shorter. I'm perfectly open to next year's data proving me wrong if some future JKR-quality writer publishes 50 bestsellers, serialized at 2,000 words each. I wonder if part of the reason that 3.99 is doing so well is because many authors with only one or two books are publishing for .99 or the 2.99, while many of the authors who have the "guts", so to speak, to sell for 3.99 are established authors with bigger back lists and established audiences who are therefore selling more books overall, regardless of the price? Very good article, I will be reviewing what you said on my blog and pointing people to look at the full report here. Couldn't see your findings on the length of descriptions though, did I miss it or was there nothing to say particularly? Thanks for a nice article. I haven't seen or heard from you since we had dinner with our spouses at Gene Parola's home in Honolulu. Hope you enjoyed my book, Hemingway, Memories of Les. The data on title length might reflect the fact that shorter titles are more easily readable on thumbnail images. A good title can't catch someone's eye when it can't be read. I think this is also one reason why so many self-published books' covers go *clunk*; they turn into mere blobs of color in thumbnail size. Even a good cover can fail at a small image size. I'm starting to put together a collection of some of the short stories I've had published over the last thirty years. DEATH AND THE UGLY WOMAN AND OTHER STORIES is an awkward length for a title, but I've come up with a cover rough with pretty legible typography and a really vivid image that should work well even at thunbnail size. When it's ready to come out in a few months, I'd been thinking of a $2.99 price point, but the data here has pretty much swung me over to the $3.99 side of the Force. Thanks, Mark. You mention sales rankings, Mark, but I can't see any on Smashwords. Would it be possible to have rankings next to each book as other retailers do? I for one like to see the results of a promotion so that I can determine if it was value for money. My last major promo was April 9th and 34 days later I'm still waiting to see the sales figures. I expect it will be another couple of weeks before I know if it was money well spent. If you're getting daily sales figures from your retailers, could these be used to provide some kind of ranking system? Failing that, could you give individual rankings grouped by retailer? Thanks Mark, for keeping us abreast of the latest. Helpful, as always! Wonderful blog, Mark. Thanks so much! Great info and very interesting - thank you so much for sharing your findings. I am a new indie author and feel I need all the info/help I can get. Thanks for the great info, Mark! I've found that my short story collection, 'Three Wishes' sells better on the Kindle Select program than it's ever done on Smashwords. Taking advantage of their free download promotions, and the many sites that help publicize these one-day events, thousands of people have downloaded the book for free, and following the events there have been spikes in actual sales. When I tried doing the same thing on Smashwords - because I'm a Nook user and want to reach readers of every device - it was a complete flop. Hardly a dozen downloads on the free offer, no sales following. I'm not sure what it would take to remedy the situation, but thought you should know. Thanks for the numbers and all the work behind them. I too write children's picture books and I understand that this genre is currently not very strong in ebooks and that most of the statistical data will not be relevant given that buyer expectations, motivations etc are totally different. However, I was wondering if any of the data was compiled on a genre by genre basis and if there could be revealing info relevant to children's book authors and authors of books other than novels. Any analytical data for children's ebook sales in very hard to find. A key factor I don't see addressed is the ratio of fiction to non-fiction within the study sample. Of the total books analyzed, how many were fiction? It's a crucial distinction. Excellent material- thank you very much. I agree that this information would be more helpful and useful if there were a distinction between fiction and nonfiction. As a person who works solely with nonfiction writers to help them plan their promotion strategy, I find the uses of this information limiting. I wish it were different and hope that future reports give data about how much of the data related to fiction and how much to nonfiction. Thanks, though, for the wealth of information provided as it was very enlightening in many ways. The $3.99 pricepoint was great info to know. Thanks for this article! Brilliant. You are generous to share. And the world of stories and ideas will forever be grateful that you've managed to design and implement a business model that puts you at the center of the indie revolution. Thanks for your incredibile insights and your willingness to help others understand. I support the idea of generating nonfiction vs fiction data in some future iteration of this. I am certain it is a thought that has not escaped you. One thing I appreciate about Smashwords, as opposed to KDP and the B&N platform, is the ability to make a book free all the time. I have a 2-book series and Book 2 is my best seller (out of 7 books total) because Book 1 is free. It's free on Kindle, also, but only because Amazon price-matched the Smashwords retailer sites like iBooks and Nook. Great article. Timely too for some of us. It's so nice to come to your site and get information we can put into action immediately. I went right to my Kindle account and changed some prices! Thanks! I'm a high school substitute teacher in upstate New York for mostly honors students, and this month all of the kids were all over a downloadable eBook, titled "PRUSSIAN BLUE: The Secret of Nannawit". As you might understand, I wanted to see what the students found so appealing about it, so one of my students offered to let me read a few chapters of the eNovel on her Kindle while she and the other seniors in the class took an essay exam. Because all I had to do while the class wrote their essays was to make sure that everyone had written their name at the top of each page when they turned-in their tests, I was able to read several chapters. I loved it! I downloaded my own copy when I went home at the end of the day. It's a long, full-length eNovel, and a little more expensive than the pricing sweet spot in the survey but, apparently, that didn't dissuade the kids from getting it. So, I guess that the moral of my comment is that if you can get school kids with electronic readers to talk among themselves about a hot eBook, it is going to sell well - at least until the next hot book. How does offering coupons and specials come into play when pricing your books? Would readers be happier to pay $2.99 for a $2.99 book? Or would they be more inclined to buy a book that costs $5.99 and is discounted to $2.99? Was the use of coupons used in this study? 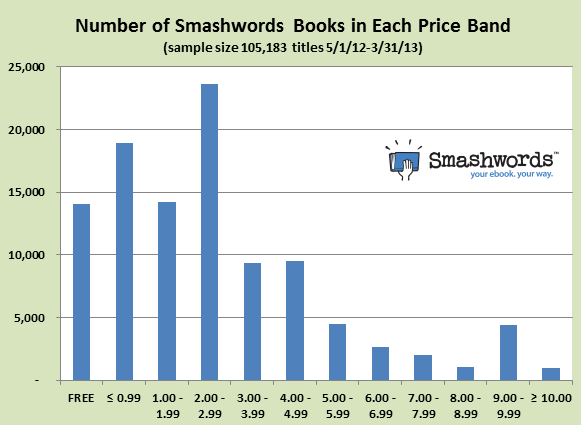 I also wonder if Smashwords numbers ring true for Amazon as well. Or would their data suggest a different price point? This was extremely eye-opening. I feel really encouraged about publishing my stories. This will definitely help when I do publish and present the price-point. Thanks Mark for this analysis on price pitching. V. Interesting. 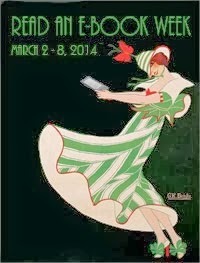 I found very little information - in spite of web searches - when my first e-books came out. Also thank you to Smashwords for the seamless distribution of my e-books to major ePub retailers whom I would not have reached otherwise. The main problem I find is with customers who have the *Free* or *not more that £1GBP* mentality which can devalue the product. Downloaded your Secrets to Ebook Publishing Success too, very inspiring and informative. Thank you very much! This pm I opened Smashwords to increase my non-fiction book price to $3.99. I decided to procrastinate and clicked the blog button instead. Wow am I glad I did to get some support for increasing the price. Also am going to refer to my book as Girls Succeed! not using the entire title anymore in my blog posts, etc. Thanks for the info. I found your presentation interesting as always. Since my book is free and doing well (6235 downloads)I am glad you threw in info on free books. You are right about making the first book in a series free when you are an unknown author. Although I have not written a series,my first book has been free for a year and I actually have people asking for my next novel. It worked out better than I expected. Thanks Smashwords. I have been working on my rewriting for several days, but I can't believe how much work I have to do and yet not succeed in what I want to do. I don't understand why no one has ever brought my e-book. Gregory...It took me 7 years to write VAlley of Sorrows. I used at least 30 beta readers to get feedback. I was fortunate that a friend gave my manuscript to an employee at International Creative Management in NYC who read it and offered suggestions. Her best suggestion was for me to employ an editor which I did. I met Mark Coker in Wichita and he suggested I put my ebook up for free the first month. In that time, I started to receive some good reviews which lead to about 350 downloads. Then word of mouth kicked in. Although I chose to keep my book free, after one year I have over 6400 downloads. Let others read your work and get feedback. It does help. But then this was not about e-books. Great to see some very interesting and useful information on self publishing stats. 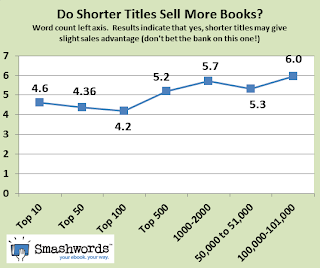 The pricing information confirms the buyers notion that inexpensive books are less rewarding. I'll be back to see what you guys post next. 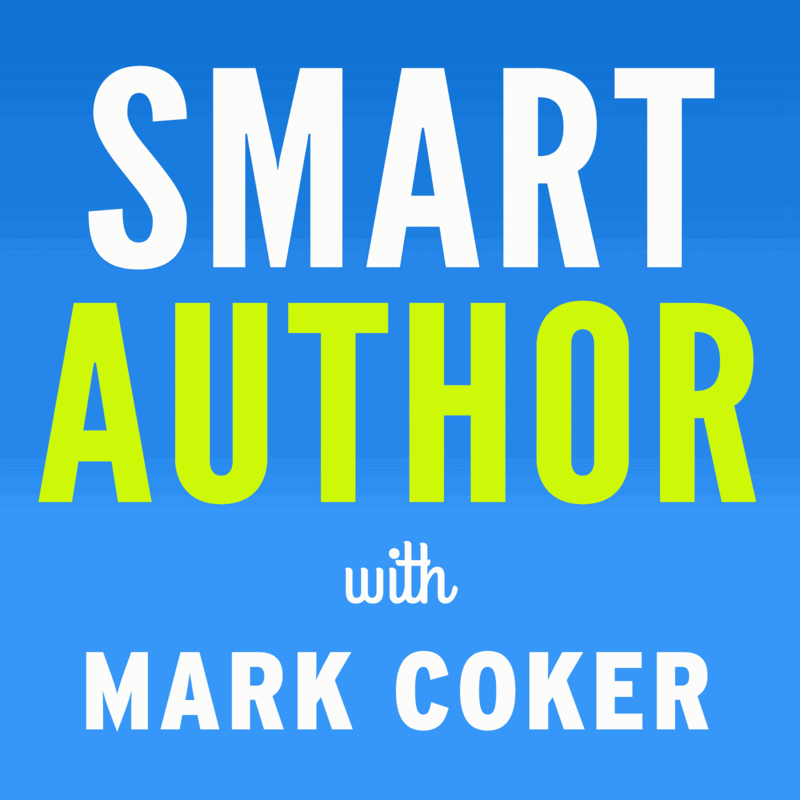 Mark Coker is a guru, an important figure in the industry. I published my two novels in Smashwords. I like its simplicity. More power to Mark and Smashwords! First, I want to say it's awesome that you're providing this kind of data. So thanks for that. 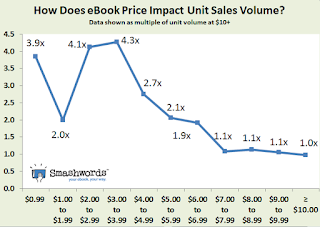 @JJ, I think the data pretty conclusively shows that $.99, $2.99 and $3.99 are the price points that get the most unit sales, and that higher word count (regardless of price) is prefered by readers, judging by their votes with their dollars. @Rachalle, I'm not a big fan of serialization either. Our data shows so conclusively that longer works please readers more. [B]ut I wonder if that success was primarily due to them writing an irresistibly awesome story, and not because it was a serial. Very important to separate cause and effect. Isn't this what the blog post is doing? Conflating correlation with cause, by assuming that the reason that those books that sell more do so because they're priced at $3.99? In other words, raising or lowering the price of a book to $3.99 will not necessarily increase sales, nor will deviating away from $3.99 necessarily decrease sales, just that, on average, books at $3.99 tend to sell better. To see this, ask how the data shows that the price is the cause. Is it not also possible that the best authors price their books at $3.99? 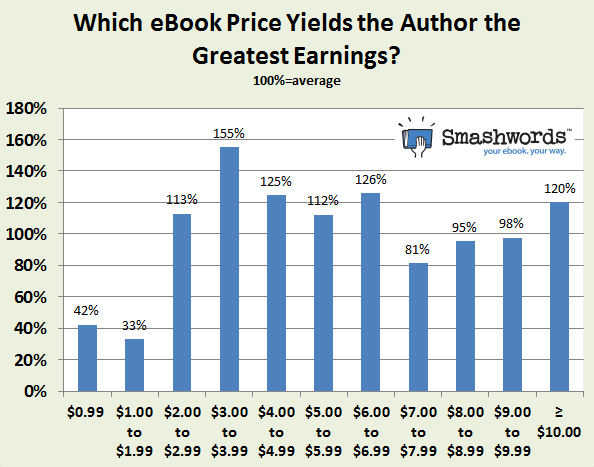 For example, imagine a scenario where King, Rowling, Clancy, et al, all decide to price their ebooks at exactly $3.99. Suddenly, $3.99 is the hottest price point. But that doesn't imply that $3.99 is the reason those books are selling so well (and the fact that $3.99 stands out so strongly in the data could suggest that the anomaly is due to external factors--it will be interesting to see next year if this effect is increased). The same thing can be applied with word count. 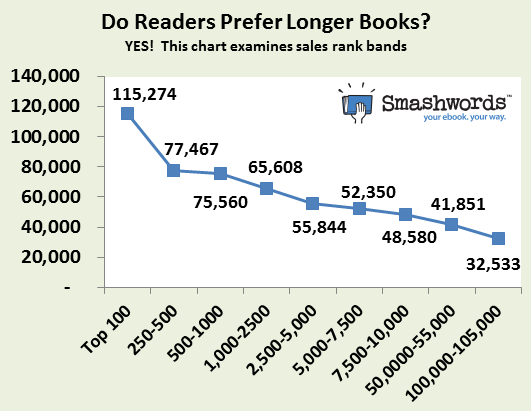 Instead of drawing the conclusion that readers prefer longer works, maybe it's just that books that are longer are simply better, or are written by better known authors--or, if the $3.99 correlation is in fact a causal factor, that longer works tend to be priced at $3.99. That's not to say any of those are the reasons, just that they are other possible ones that, lacking more data, are equally as likely as reader preference. To determine reader preference, things like popularity would need to be controlled for; by the data's nature, it's not an unbiased sample with regards to user preference. Again, thanks for the stats. But it's nice to remember that there are lies, damn lies, and then statistics. Lying by telling the truth is still lying, and that's what statistics tend to do--the average is not the specific. The article begs the question: How does this perfect book get seen? You can't sell copies if your book isn't seen by readers. 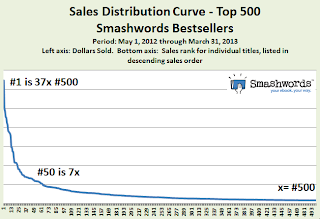 You can't get near the top of Smashword's lists if you're not selling, but you can't sell if you're not near the top of the lists. Catch-22. Al, check out my older survey HERE which explored discovery. Also check out my free ebook, The Secrets to Ebook Publishing Success. It has a lot more on discovery. Hi Mark, I am a relative newbie to e-book publishing. A question about book length: is there any difference in the best book lengths between fiction and non-fiction? Hi Pastor Tom, welcome to the brave new world! We didn't break out the difference between fiction and non-fiction, and it's fair to say our data is heavily skewed in favor of fiction. Regardless of our findings, I think you should write to the length that your book requires to maximize reader happiness with your knowledge or story, no less no more. --Do readers like or NOT like the inclusion of excerpts from the author's other books at the end of a book? --Is the Library Price meant to be set higher than the normal price? What difference does it make? It appears to be just one or two sales in any case. --Does the price aversion to prices above $4.99 include books for a small readership (literary books, semi-scholarly works)? I noticed that $8.99 does better than $7.99 and even $6.99 does better than $7.99. How do you explain this? Could it also be that there are fewer books published at 1.99, or did you look at the total volume of books offered at 1.99 and still conclude that the price is a black hole? I know an author, Mark David Ledbetter, who sells a ton of his "America's Forgotten History" series at $1.50. My self published book is going to be released in Oct but this is not why I am writing. My question is the following. My book has a word count of 222.000. A large book but big story, which I could have elongated even further. I have full rights over my book but do I have full rights as to its pricing, as I am published by a large self publishing company? Thanks for sharing this data!!!! Question. What is the standard deviation on the book lengths for the top 1,000 or 2,000 books? Or the range? Averages can be tricky, and it might be that the range of what's successful is huge. I'd really like to see the distribution over the length range. Can you shed some light on that? I've asked myself why people absolutely love my book and it has a cult following, but my sales aren't reflecting that. I think it may be due to the low pricing and the disrespect I get from readers because of the low price, with comments like "Great for a FREE book." Or "Pretty good for a $1.99 book." I priced it free to gain readership, and this worked, but not enough. I've now changed all my prices to $3.99 and we'll see how that goes. I do admit, I am every scared. It feels like I'm embarking on a new journey. But, it's all in the name of research. I can handle a drop in sales just to see if it really works. And who knows? Maybe it really will work! Great info, thanks for sharing it. It gives me a lot to think over before publishing my first book. Most of my sales are currently in the UK. Are these prices directly comparable in the UK or would a currency conversion of $3.99 to, say, £2.45 be the sweet spot in UK? This is very useful info. But please make your right sidebar stop having spasms so I can read your posts without feeling ill.
Has this data changed significantly in the last few years?